Bark! Meow! Oink! Ribbit! 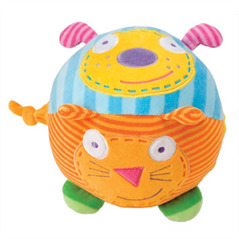 This soft and colorful animal ball is divided into four fun faces – Dog, Cat, Piggy and Frog. Press the right ear of each animal to hear their individual sound. Bell chime inside. Helps babies develop motor skills through catching, rolling, and grabbing. One of the more stunning plush baby toys we've seen. And the animal sounds are ridiculously cute. Home Nephew and Niece Gifts 'Round the Farm by ALEX Jr.